We spent last weekend at The Calvert Trust in Kielder. As well as enjoying some fantastic activities that were suitable for the whole family, we also enjoyed some relaxing down time together in our riverside chalet. 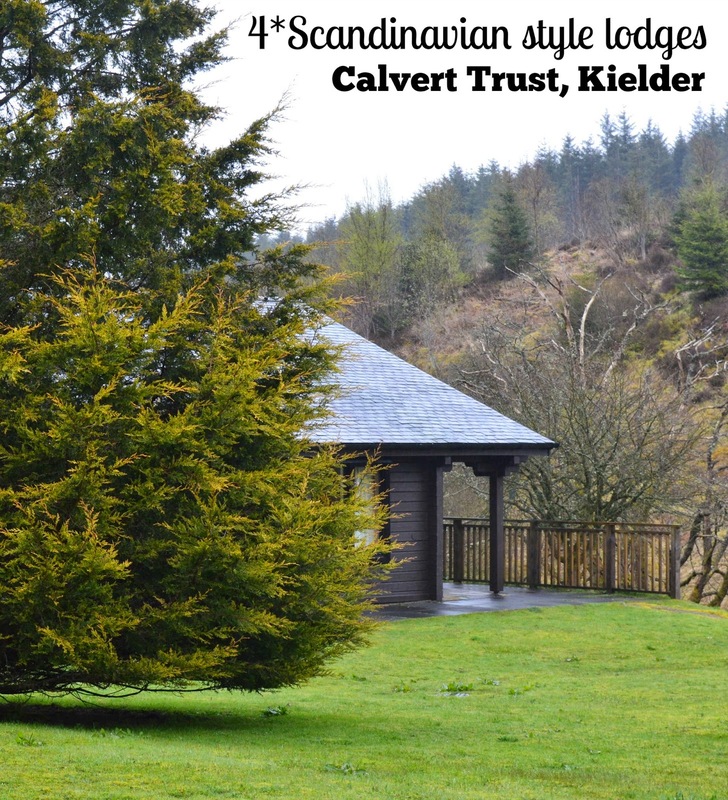 The 4* Scandinavian style chalets at The Calvert Trust, Kielder are extremely well appointed. There are less than 12 chalets on site meaning you aren't overlooked and it never feels busy. Each chalet is detached and in their own private plot with individual car parking. Chalets are either situated by the riverside as ours was or up a small hill next to the play park with beautiful countryside views. Our outside space was wonderful. We could watch rabbits play on the grass from our window, sit on our outdoor seating and watch the river and listen to the birds and wildlife in the trees around us. What struck us about our chalets is just how spacious they were. Each chalet is fully accessible with lots of adaptations for wheelchair users and sleeps up to 6 people with one double and two twin rooms. Everything is provided from an HD TV with freeview and DVD player, dishwasher, washing machine, dryer and iPod docking station. Our beds were made up on arrival (very handy as we were late in arriving) and we were all provided with towels. There were lots of welcome little touches including a basket of homemade biscuits (which by the way were amazing), dishwasher tablets, tea and coffee and washing up liquid which might only be small gestures but made a huge difference to us. One thing you do need to remember is that you really are in the middle of nowhere. There is no phone signal, no access to wifi from your chalet (although you can from reception), no shop on site and nothing will prepare you for the dark skies. I knew that Kielder is home to the darkest skies in England but I honestly was not prepared for just how dark it was going to be. When we stepped outside during our visit in May after 11pm we couldn't even see our hand in front of us it was so dark. It was magical though and I am really pleased to have experienced a true dark sky. I usually work every Sunday but had this weekend off work and there is nowhere I would rather have spent it than cooking a delicious Sunday lunch with my little helpers in our chalet. Our kitchen was fully-equipped and packed with every utensil/dish you would need to prepare a variety of meals. I didn't take any photos but we had two toilets and a large bathroom/wet room with both a bath and shower. Perfect! We were lovely and cosy in our chalet which was centrally heated with your own thermostat to adjust the temperature if required. During our stay we spotted the glorious Straker Chalet which is the place to book if you are looking for extra luxury. This chalet features an eco-friendly hot tub, home cinema sound system, blu ray player, Xbox 360, telescope, American style fridge, underfloor heating......I could go on. Another accommodation idea at The Calvert Trust, Kielder is the Sky Den Tree House which recently featured on George Clarke's amazing spaces on channel 4. This unique space sleeps up to four and is available for only £175 per night. The Sky Den's roof can fully open which makes it the perfect place to appreciate Kielder's dark skies. When you stay at The Calvert Trust you can use their hydrotherapy pool for free and book as many activities as you wish (chargeable) or you might like to do nothing and just use your stay to fully relax and unwind. There is a well-equipped reception building which is home to an indoor games room, snoozelum, television lounge, licensed bar and snug which is also home to a dining room which opens for breakfast, lunch and dinner to serve home-cooked meals at reasonable prices (see sample menu). There is nothing more we could have asked for during our stay. We would highly recommend The Calvert Trust as a place to stay, relax and unwind. We can't wait to return. Looks amazing, not sure I could do more than a short break if there's no wifi, it would literally kill me! Good place to escape to though when the world is getting you down. The lodges look wonderfully roomy and cosy at the same time! Lovely. I quite like going without wifi and phone signal- Nice way to get a bit of peace! Just popping back again via #lovenortheast I love keilder. I think next time I'd like to try the sky den !